South of the Border: A Luchadora’s First Pilgrimage to Mexico City | "Jump Higher!" I’m don’t exactly recall how we decided that I was going to accompany El Fénix on his next trip to Mexico City. It is possible that there may have been a bit of drinking involved in the initial conversation. Nonetheless, the idea stuck, and by the beginning of January we had bought our tickets. It was official. I was going to Mexico. I’ll be honest; I was nervous. Other than trips to Canada (which doesn’t really count), this was my first time out of the good ol’ US of A. But more than anything, I was excited. I’d spent the last year listening to stories from El Fénix’s first two adventures. It was high time I experienced Mexico City first-hand. On Saturday we landed at the Benito Juárez International Airport. During the descent, I was absolutely flabbergasted by the sheer size of that city. I kid you not; even from the air it was impossible to see the edge of the city. Buildings as far as the eye could see! I knew that Mexico City is the third largest city in the world, but coming from Washington I guess I really had no conception of a truly enormous city. I do now. Our mask maker, Miguel, and his wife met us at the airport. From there, the first order of business was to put some food in our faces. Miguel took us to Taquería Chableo, which specializes, exclusively I believe, in pig, and is decorated entirely in lucha libre memorabilia. I will make no secret of this: after hearing stories of other traveling white folk who had run afoul of slightly-off pork in Mexico, I was a tad concerned. That is, until I took note of the extensive sanitation measures taken by the restaurant’s employees. Turns out this was probably one of the safest places we could’ve eaten. In front of the lucha mural in Taquería Chabelo. Now let’s talk about chicharrón. For those who are unfamiliar, that’s pork rinds. Not the small, stale, nondescript chip-like snack as in the US. Chicharrón is a full-on slab of freshly deep-fried pig skin. A bit of background pertaining to chicharrón: El Fénix fell for chicharrón on his first trip to Mexico City. Hard. His affinity for it has become somewhat of an inside joke around the gym. Moral of the story: I was now honor-bound to try chicharrón. So, shutting off (or at least muffling) the loud portion of my brain that was shouting, “YOU’RE EATING SKIN, DAMMIT!” I loaded up a tortilla with a chunk of chicharrón, some nopales (cactus), and a squirt of lime juice. Wow. El Fénix wasn’t kidding. Chicharrón topped the list of potentially unsettling things that I have eaten and thoroughly enjoyed (…that is until you consider the chapulines—grasshoppers– I ate the next day). The rest of that first day in Mexico consisted of acquiring a secure room in a hospedaje (which is like a cross between a boarding house/ hostel and a hotel), and partaking of far too much whiskey and tequila whilst getting to know Miguel’s family and the other people in his workshop. Sunday dawned, and I woke up to learn that a hangover crossed with altitude sickness is not a good time for anybody. I must apologize profusely to my traveling buddy for this. Granted, I was exceptionally pleased that my misfortune could be traced back to such a relatively mundane source and not to the food, as I initially feared. As the day progressed, I recovered enough to go meet Sepulcro, our coach’s old friend and wrestling partner. Sepulcro owns a corner store, where we ended up spending a fair amount of our free time. Either there or at Sepulcro’s house eating food insistently prepared by his wife. It was a fairly low-key day, all things considered. The next day we went to training. Training at altitude was just as hellish as I expected, though I think I fared better than I had planned. I don’t feel like I made a complete fool out of myself, at least. Aside from having very low cardio endurance as a result of the reduced oxygen availability, my technical skills as a luchadora seemed to be sound (if requiring some polishing). Despite the altitude, I really enjoyed the workout. It felt like a rite of passage finally getting to train in Mexico. Unfortunately, due to extenuating circumstances and an otherwise full itinerary we only got to train once on this trip, but I hope to be able to train more on future trips. 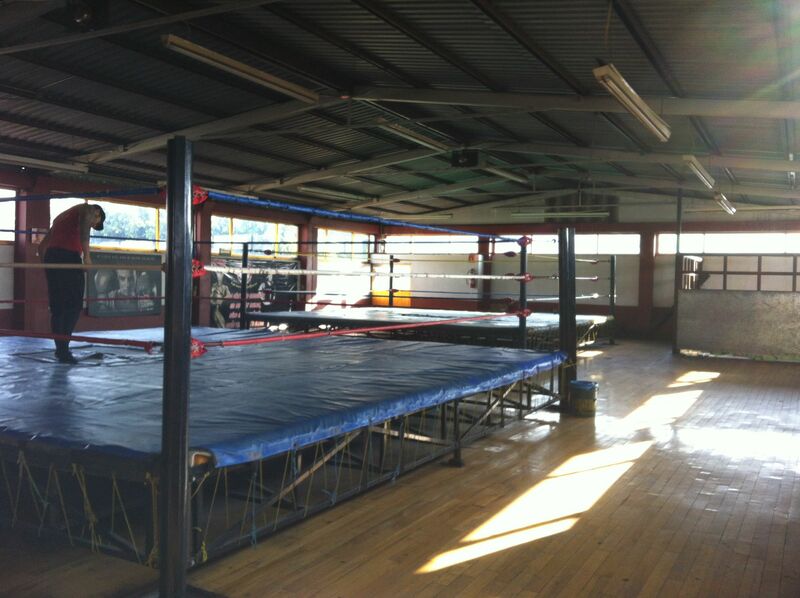 The two rings at Guerrero Gym. That night we ventured to Plaza Garibaldi with Erick, Sepulcro’s son. Plaza Garibaldi is known for having an abundance of wandering mariachi bands, and people drinking in the street at all hours of the day and night. 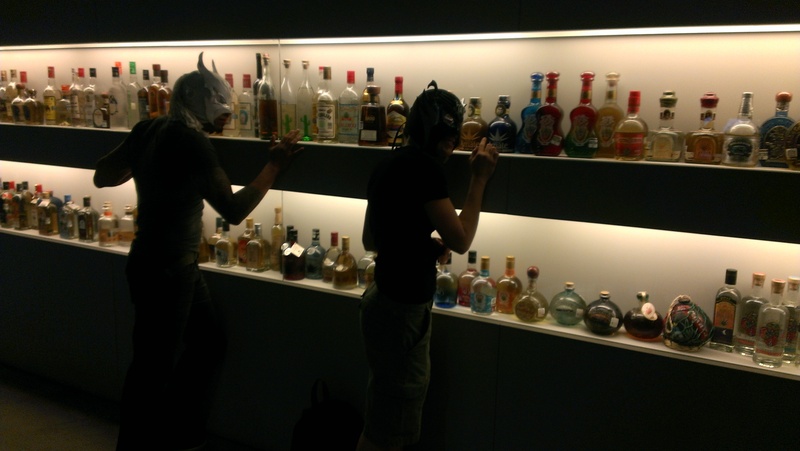 What I didn’t expect to find there was the Museum of Tequila and Mezcal. Admitting us to that building was like setting children loose in a candy store. Plus there were samples up in the museum’s terrace bar. The three of us spent the evening observing the Plaza from the balcony, sipping tequila, and listening to the mariachi band that had been hired by a couple across the room. As I said: like kids in a candy store. 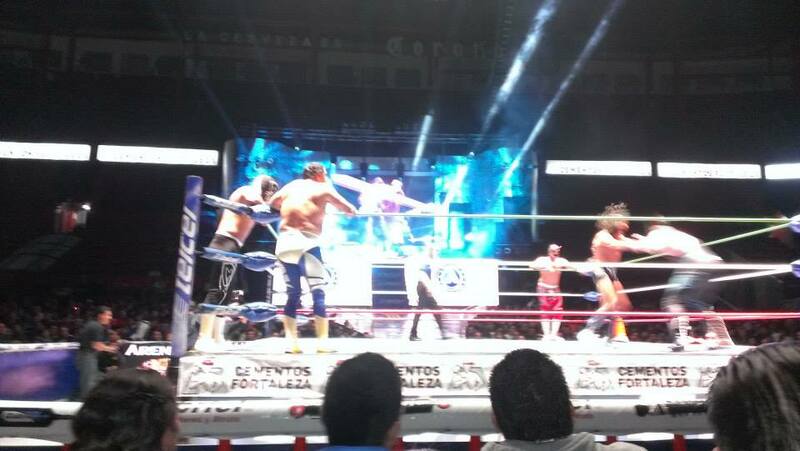 The main highlight of Tuesday was going to Arena México to see the luchas. Speaking of rites of passage, this was roughly the equivalent of going to see the NBA of lucha libre. What an experience! We had third-row seats, which was close enough to see the outline of the thong that one of the luchadores was wearing under his lycra. Fast-forward to later that night: this time it was the food. That much I was sure of after a few delirious hours of fever and sleep during which I apparently commented on the strange creatures of a wildlife documentary El Fénix was watching. Despite not having drunk the water or eaten street food, I had fallen victim to a stomach bug which had me down for the day. I felt better about my immune system when I learned that Sepulcro was suffering from the same symptoms. It was probably no coincidence, as we had eaten similar food stuffs the day before. Happily, after a trip to the doctor and some antibiotics, I was more or less up to speed again the next day. Just in time to be a full-on tourist! Thursday we ventured to an artesian crafts market with Erick and his brother Obed, where we ogled the handiwork of various craftspeople and probably spent a bit too much money on superfluous things. But it was worth it. The remainder of that evening was spent at Miguel’s workshop, where I got a crash-course in mask making. We had come to our final day in the country. 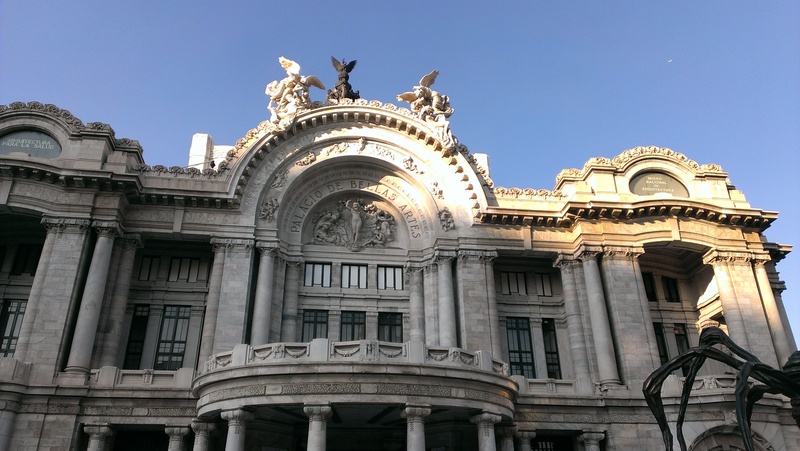 What better way to spend it than exploring the Zócalo? After getting off the metro, we stopped by the Palacio de Bellas Artes, with its enormous domed ceiling and stunning granite and marble architecture. Then on to the Catedral Metropolitana. Also an impressive spectacle. After a turn around the Plaza, we began our trek back to Arena México for one last shot at the luchas before we returned. On our way we passed through a communist protest, complete with a man megaphoning the shortcomings of the government from the top of a bus, and a police barricade—riot shields, rifles, and all. 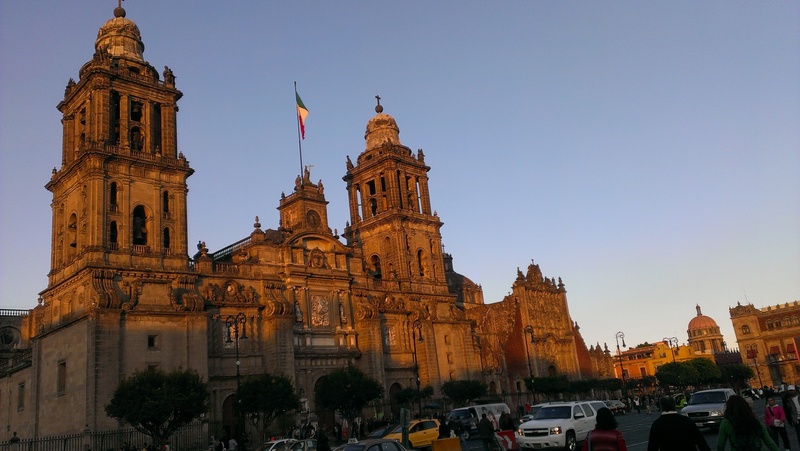 … and the Catedral Metropolitana. As the plane back to the states sped down the runway, I was both relieved and a bit sad to be leaving the city behind. Relieved because it takes a lot of energy to quickly adjust to an entirely different pace of life. In that respect it had been a stressful week. But mostly sad, because there was so much more we hadn’t gotten a chance to experience. I definitely want to go back, maybe even as soon as this summer (if I can wrangle my finances appropriately). I’m going to miss all the amazing people who welcomed us into their homes, and the sense of adventure and discovery that comes with getting to know a foreign country. A week is simply not long enough.